CSIR will hold the Joint CSIR-UGC Test on 21st December, 2014 for determining the eligibility of the Indian National candidates for the award of Junior Research Fellowships (JRF) and for determining eligibility for appointment of Lecturers (NET) in certain subject areas falling under the faculty of Science & Technology. The award of Junior Research Fellowship (JRF) to the successful eligible candidates will depend on their finding admission/placement in a university/ national laboratory/ institution of higher learning and research, as applicable. 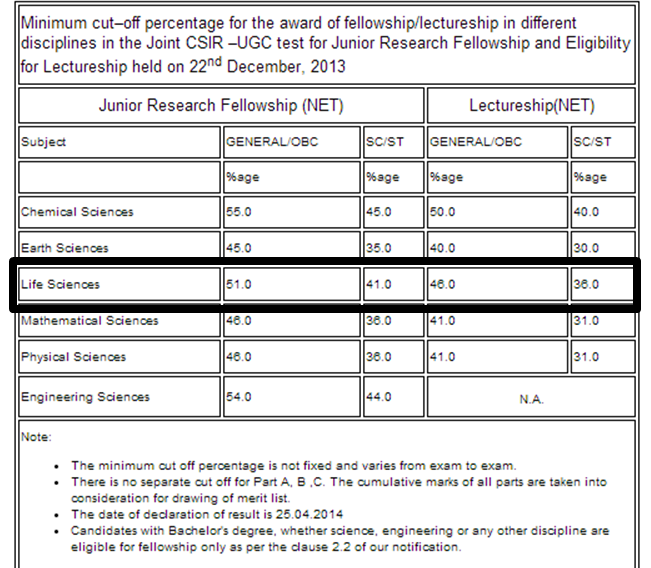 Exam Date: CSIR-UGC JRF( Junior Research Fellowship )And NET (Eligibility for Lectureship) : 21st December, 2014. For Junior Research Fellowships (JRF):Maximum 28 years as on 01-01-2014 (upper age limit may be relaxed up to 5 years in case of candidates belonging to SC/ST/OBC, Physically handicapped/Visually handicapped and female applicants). The final result of this Single MCQ test may be declared sometime in the month of March/April, 2015 and fellowship to successful candidates will be effective from 1 st April, 2015 with the validity period of 2 years for joining the fellowship under CSIR Scheme.